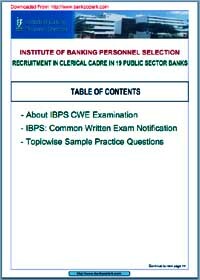 (Download) IBPS: Common Written Examination (CWE) Guide: Free E-Book | BANK EXAM PORTAL : IBPS, SBI, PO, Clerk, IPPB, Bank Jobs Aspirants Community. We are providing topic wise Practice Questions for you reference. This will help you to understand the exam pattern.